The newer sets are increasingly more like computers, especially those able to access the Internet. Those connected TVs can surf the Internet and serve movies and music online. In addition, smart TVs allow you to install applications and have processors as powerful as those of many smartphones. With all these new features, the remote ordinary is no longer valid. Often you need to enter text, especially for searching or browsing the Internet. Manufacturers have designed advanced remote controls with keyboards that resemble those of computers, and there are models that allow you to use optional wireless keyboard. The point is that these forward controls are often difficult to handle for many users. Hence, the designers seek new ways to interact with the TV to be more intuitive. 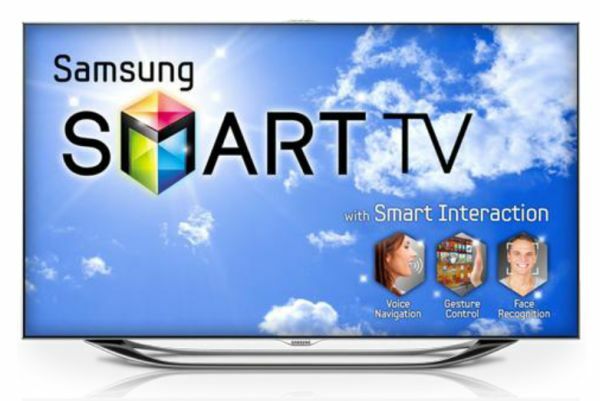 The Korean company has found a solution for your smart TV platform with Smart TV Samsung 2012 it calls Smart Interaction. Has a number of functions based on voice control, gesture control and facial recognition. Thus, the user acts as a remote control talking or moving in front of the screen. 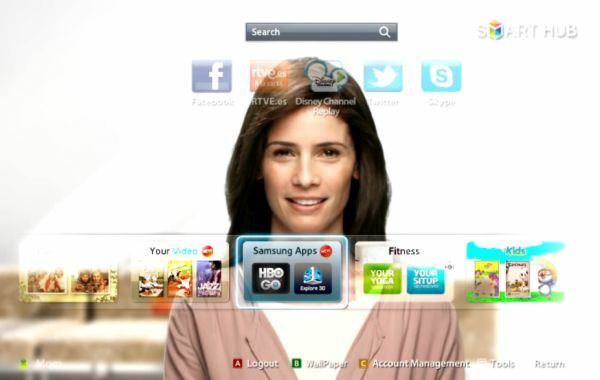 Samsung Smart Interaction is included only in selected TV series 8 and 7 in the new catalog for the year 2012. Requires that the unit is connected to the Internet and it works in practice can vary depending on the language and conditions of the environment where the TV is installed. How does the user can choose which control? When browsing the TV menu (the Smart Hub) to view the applications and content available, there are some icons with the controls available: voice, gestures, keyboard or mouse. Some options are complementary, for example, voice and gestures. How to enable voice control using the command "Hello TV" and then select an option from those on screen by moving the hand. The idea is to manage certain functions talking to the TV. Voice Control in Smart Interaction now includes more than thirty voice commands. To activate it, just say "Hi TV". It then displayed a list of available voice commands. Volume up, volume down, start (an application) or exit (an application) are few. It also serves to move and down the channels (channel up / down channel). With your hand you can select the volume bar to adjust it. The movements should be unhurried. The reference that appears is a hand-shaped cursor. If you lose your way, just lower your hand and try again. You can also search the Google toolbar. Recall that the two microphones on both sides of the register dealing webcam user's voice. So we need to be within reach, or too close (five feet minimum), or too far (5 meters maximum). Those lucky enough to have large rooms may end up talking to the special remote control with Smart Touch Control Samsung, which reaches 25 meters. For natural language searching, the company also advises using Smart Touch Control command. The TV talking the language best understood by remote control, which by the microphones built into the top of the screen. To do this you have to press the voice button on the remote and away between 10 and 15 inches from your mouth. Almost all voice commands also work through gesture control. The TV captures movements of both hands, either. Therefore, both lefties and righties have no problem. There are two basic gestures. Opening and closing the fist is used to select an option within the menu. The other hand is to slide right and left, and vice versa, that goes for scrolling through menus, similar to using a mouse. For gesture control function the user must be in front of the screen at the same distance recommended for voice control, ranging between 1.5 and 4 meters. Besides, it is necessary that the room is sufficiently lit to allow the camera to see clearly to the user. However, the degree of luminosity depends on the existing required when carrying out the calibration of the TV. To begin the user must move a bit the hand that detects the pointer. You can then open the Smart Hub menu, scroll through and select options. There are all the applications downloaded and installed on the TV. Can activate the voice control and movement time. To select an application, just close the hand. Drawing a semicircle in the air will come out. The heads of Samsung recognize that, for now, the vast majority of applications are not compatible with voice controls and gestures. However, the company is working on adding the ability to interact with the TV. 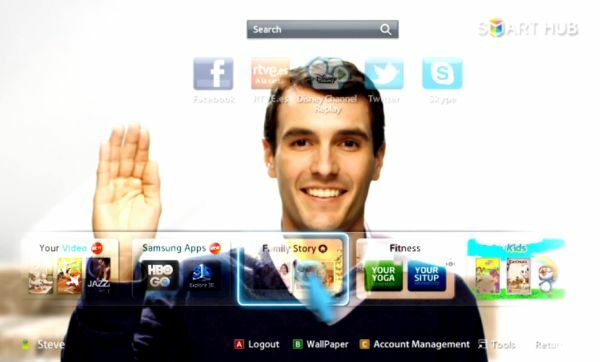 A Samsung likes to say that their TVs with Smart Interaction "remember" the user. The facial recognition system uses the integrated webcam to record the faces of each of the householders. In fact, the TV can store up to five different profiles. Each profile can be associated with the photo of a user. That way, you save typing the user code and password. Simply place the person in front of the TV. The TV through the camera captures the shapes and volumes of the face to identify it by comparing it with the images previously stored profiles. Operates as an access control system to the TV and some applications. The face becomes the passport. 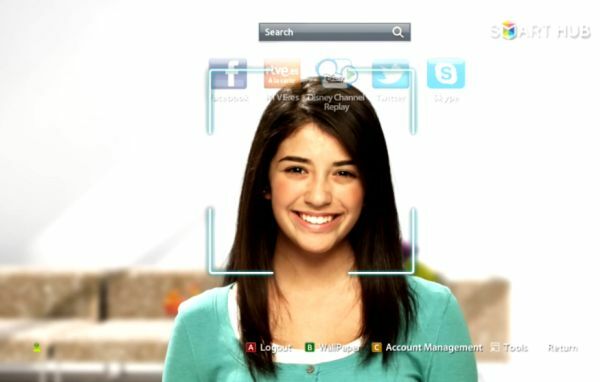 Thus, the user can set the facial recognition as a means to enter your Skype account, for example. It is very interesting as a tool for parental control to protect minors from the house, lest he be exposed to content unsuitable for their age. Anyway, Samsung warns that facial recognition is less secure than the logon user ID and password. Interaction Smart benefits are not available on all televisions connected to the manufacturer, but only in the high-end models more recently. All designs have superdelgados. The screen diagonals ranging from 40 to 64 inches. Altogether there are five televisions, one of them is a plasma (Samsung PS64E8000GS) and the rest have LED-backlit LCD screens. Three belong to the ES8000 family, and are the UE55ES8000S Samsung 55-inch, the Samsung 46-inch UE46ES8000S the Samsung 40-inch UE40ES8000S. Finally, the Samsung UE55ES7000S of 55 inches, is part of the ES7000 series. All agreed that integrate a webcam with two microphones, which are located in the center of the top. The webcam is HD with a microphone on each side. It is possible to slightly tilt the camera to properly serve in table users. Furthermore, these sets are pre-installed application for camera and voice controls and movement, apart from the face recognition system. They are all 3D TV, and come equipped with two active 3D glasses.